What does it mean to have a process and sticking to it? A repeatable business process or a process that works for what you are working on is like finding gold. 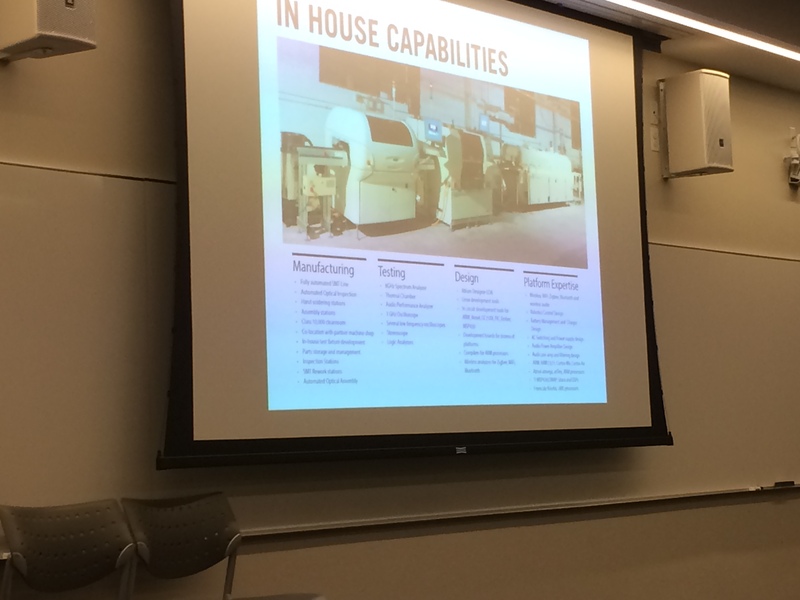 I have been talking with startups that want to automate the hardware product development process. The scenarios run the gambit from automating the idea submission process, to just automating the PCB/PCBa, and then there is the ones that try to automate the process from idea to production. The sentiment is very clear, people want to get rid of the human element or at least lessen the human effects. Such as; some people are hard to deal with or they don’t understand me or the best one yet – you don’t understand my business. All of these shouts in the crowd makes us seem antisocial. I believe that it is a collaboration between willing parties that produce the best work. The machines do not have the capabilities to act totally autonomously (for now) and with creativity. So when it comes to hardware product development you need both. There are just too many variables to automate. The process approach works. It works like a well oiled machine and best yet it can be adjusted with feedback. Take this example I ran into all the time. The misunderstanding game. You schedule a meeting, but at the last minute the meeting changes from an in-person meeting to a conference call. Not a video call. Once the call starts you can hear on the other end the person click with the mouse and the keyboard. What are they doing over there? They are distracted. The call covers the topics discussed, but the key elements of the call. I will call this the understandings fall to the waist side. What has happened? Unknowingly without you paying attention the parties on the call don’t get it and the call was a waste of time. How often does this happen? Well in my time more times than none. So what I do is make sure you can see the person, at least at first. And this can be done easily now with the Google Hangouts or Skype. The face-time is essential for building trust and the relationship. After the sense of trust is there then the non-face-time tools will work much better and the understandings will not fall to the waist side. A personable approach just works. Why is this part of the process and not assumed to be operational? That is because too many people are rush rush rush and too busy to know how to make a relationship. The relationship building is essential to the process. Once a sense of trust is there, even a little bit the rest will be simpler. Mistakes will not be the blame game, but a game of how do we fix it and come up with a creative way to solve the problem. Interwoven in the process is trust. How could you then automate this in a computer? People have thought of various was to build trust or cred online. There is klout, linkedin, etc. However, we know that social media can be faked and the posts can be BS. Nothing new there. Before all of this people would BS on their resume and the only way to find out was to be a good interviewer or try the candidate out. Been there done that. Could you automate this? What would be a software solution for trust building? There is the recomendation engine solutions, but what happens if you are new to the site and you have none listed and you have many years with experience. What would be the online solution for trust? Let’s experiment with a particular scenario – I am a hardware startup, I have a great idea, and I want to get my product idea to market. I have a limited number of skills. So let’s say that you are not very technical (You don’t know manufacturing) and you have made a software startup before. What is the process to use? Every step of the way you can get people to help. The things to watch out for is money, time and quality. Do you have the money to pay people, can you get people to help you for free or can you learn what you need to know yourself? How fast do you need to get this product out? If you say I need to sell this within a few weeks, you are crazy – That will never happen. The best thing to do is to research other products that are similar as yours. Research the business portions of your product idea for viability. That is right – Is it a viable product? There are methodologies out there to help you such as Lean Startup. Viability also means that you need to dive in and see who out there is doing what you want to do, what markets they and you want to be in and get a sense of the cost. The cost is not in the details yet but is important to know what the market would pay for your product. Feasibility is the next step. Can this product idea be built? I have heard some crazy comments about this. Oh yes, everything can be done. However most people read that up to that point and then don’t read about the cost and time elements. Sure you can develop a new method of communication (for example), but what about the technology and what about the market acceptance? Is it too soon? Does the technology need more time to cook? By cook, I mean does it need more research and development. Did you pick a technology that no one is using or the only ones using it are the big players? For you to enter you need to be a big player. Startups that have reached this step tend to look at the future technologies and don’t put into account this. An example of this is that you want to use a screen technology that would make your product look gorgeous. You find a technology that is great, but very few people are using it and the players are big companies. What do you do here? You start out and create a version 1 of your product. The product does not use the new technology, but you can get a product out there that can be used and feedback gained. Or you can wait till the technology matures. If you are a large company with limited access to the technology then you can wait. You have the time and the money. For a startup, you need to get something out there so you can tell if the product is the right one for that market. It is best to know now before you spend a lot of time and money on the product. Look at it another way. You need to gauge the market and get data so you can understand the acceptance. Through the lifecycle of the product, you will have other versions of the product. This should not be your first and only one – how will you have a business with repeatable rents? So come up with version one. Call it the MVP or call it the beta product. Get the data and repeat. Hardware product development takes time. You can tell from the latest crowdfunding campaigns that people have underestimated the duration and skills needed to deliver. Get someone that has done this before and ask their advice. Find out how similar products were made. What were their hiccups – Then put together your plan. Having a process and a plan will make you successful. In future blog post, I will get more specific about how all this works. I have thought about creating a multipart post, but I have not thought that far yet. I need to get my writing process together and then create a plan. “Instead of hiring people, we’re using robots,” Ellram says. Chinese companies are also using robots, but U.S. manufacturers are ahead of them, she says. via Made in The USA Back in Style for Small Businesses. Everyone wants manufacturing back because they think it will bring back jobs. Fills me with American pride to see people trying to bring it back. However it is to be seen if the return is an automated one at best. Where are the jobs for humans? The jobs will be for the robots. 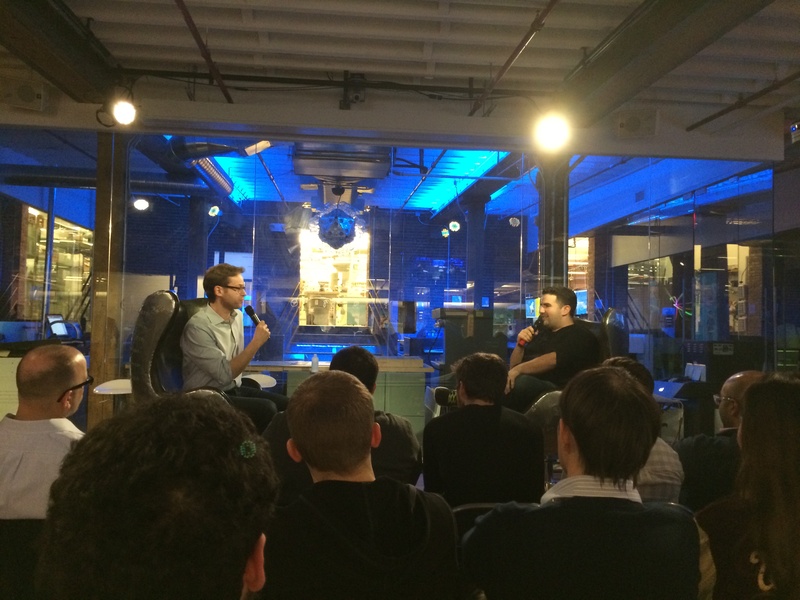 Last night I attended the March 2014 The Product Group Meetup run by Jeremy Horn. It was a packed house. They need another space to host this event. The theme of this month’s meetup was “Do you like your product person?”. There was the presentation of The Best Product Person of 2013 and then a lively discussion of the Featured Product, VenueBook. The format of the event is organized well. Jeremy compares it to being home for Thanksgiving dinner. I can attest to that fact. Everyone just jumps in and the conversation goes around the room. Sometimes Jeremy pushes the discussion along so more people can participate. The discussions are always very active, informative and fun. First is the question of the evening. Everyone gets to introduce ourselves and say a simple answer to the question. This time it was “Do you like your product person?”, yes or no. My answer was a resounding yes! The next part of the evening was announcing The Best Product Person of 2013. The winner was Adrian Jank. Congrats Adrian for winning this year. The final part of the night was the discussion of the VenueBook product. VenueBook is an online SaaS System that venues and party planners use to effectively plan events and make reservations for the spaces. There is definitely more to it because VenueBook replaces the accounting systems and payment systems for the venues and planners. It is a great idea that time has come. From the looks of it, it makes planning an event very easy. Their database of venues is huge and of great quality. I have attended events at a lot of the venues listed. The discussion ranged from how they got into this business, what makes them unique in the market to issues they would like the group to help them with. I will not get into details as I don’t want to reveal anything that could be released at a later time. Much to say is that they have some great people working with them on their team. I wish them the best of luck with their business. 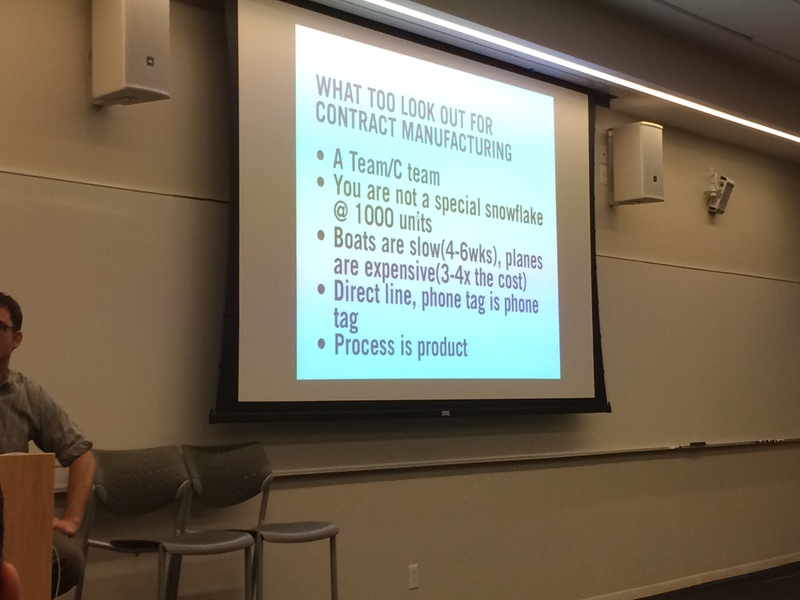 The 15th NY Hardware Meetup and 16th MakeIt NYC Meetup Join Forces For a Blow Out Event! My how much the community has grown. The NY Hardware Meetup is at it’s 15th meetup. 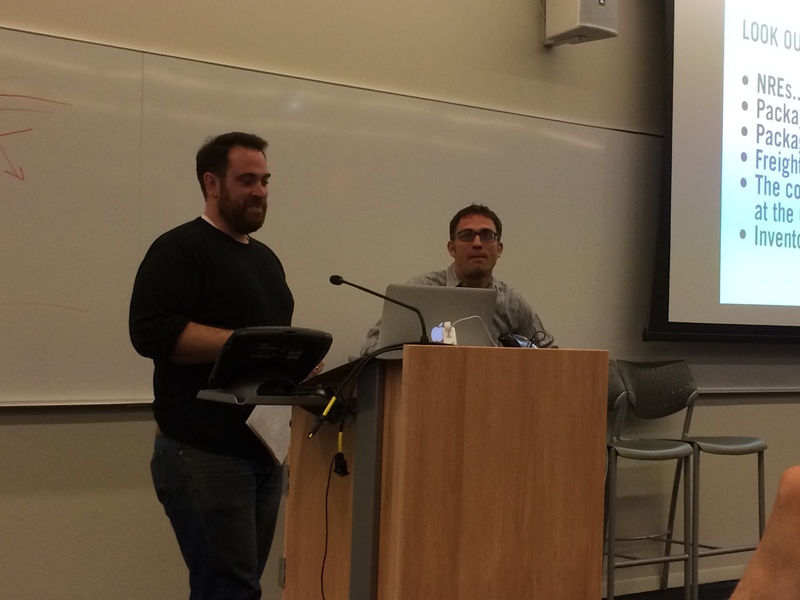 The MakeIt NYC is at it’s 16th meetup. 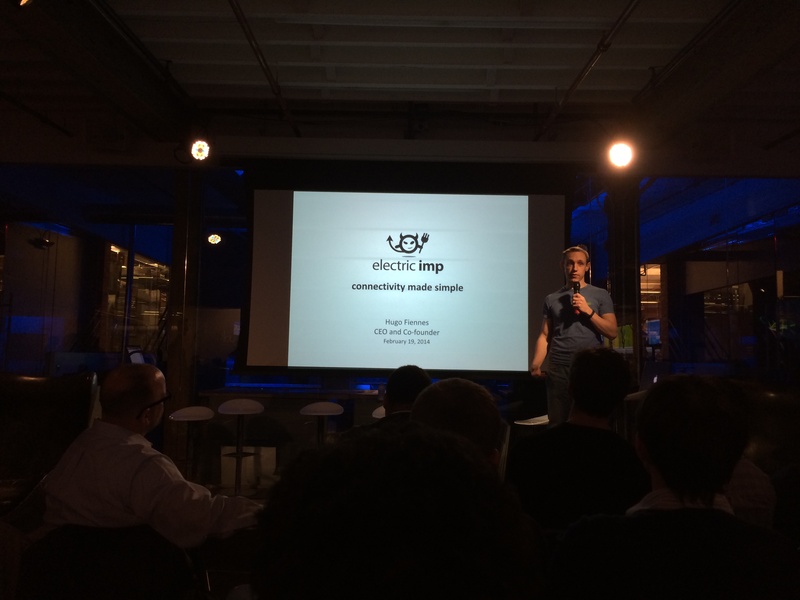 All the meetups have been chock full of interesting stories coming from the trenches of the hardware scene in NYC. This one is no different except that the attendance was through the roof (see image above of standing room only crowd). 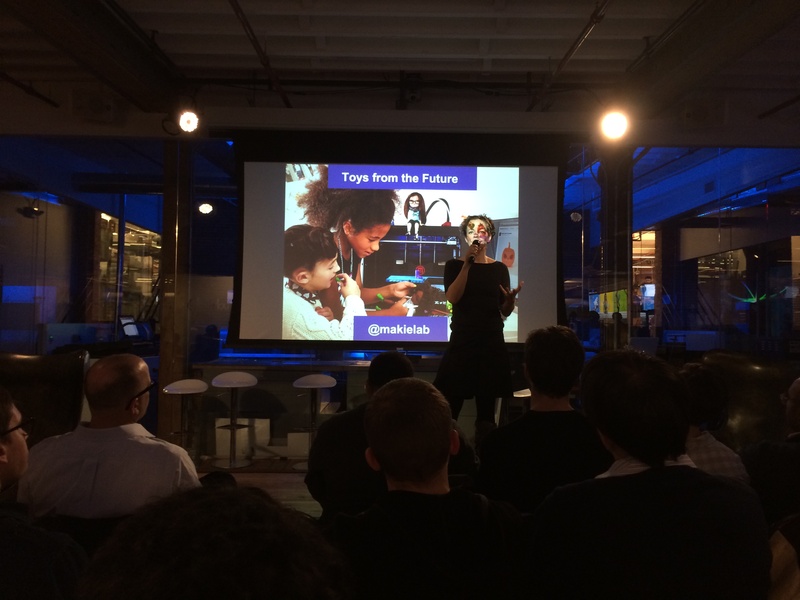 By the way the back of the head in the foreground is Jonathan Hirschman organizer of the MakeIt NYC Meetup. If you wanted to know. 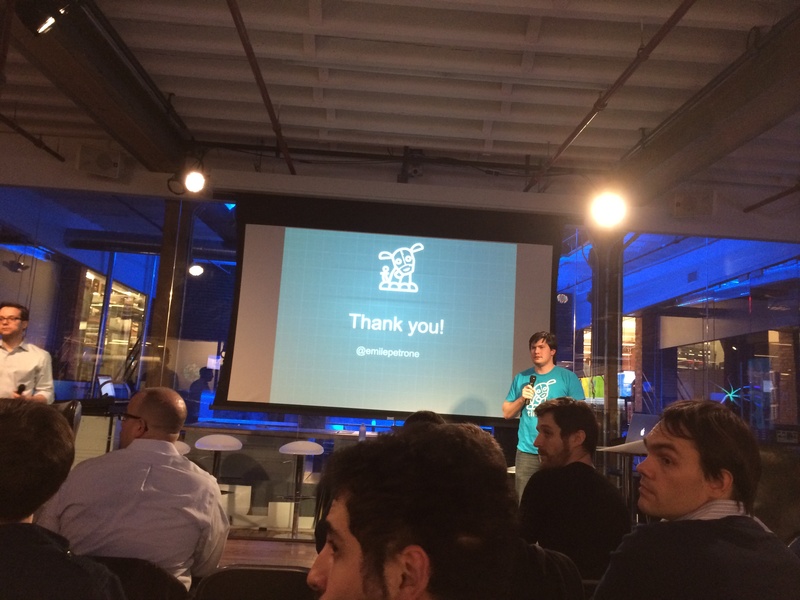 This event was a joint event between the NY Hardware Meetup and MakeIt NYC Meetup. 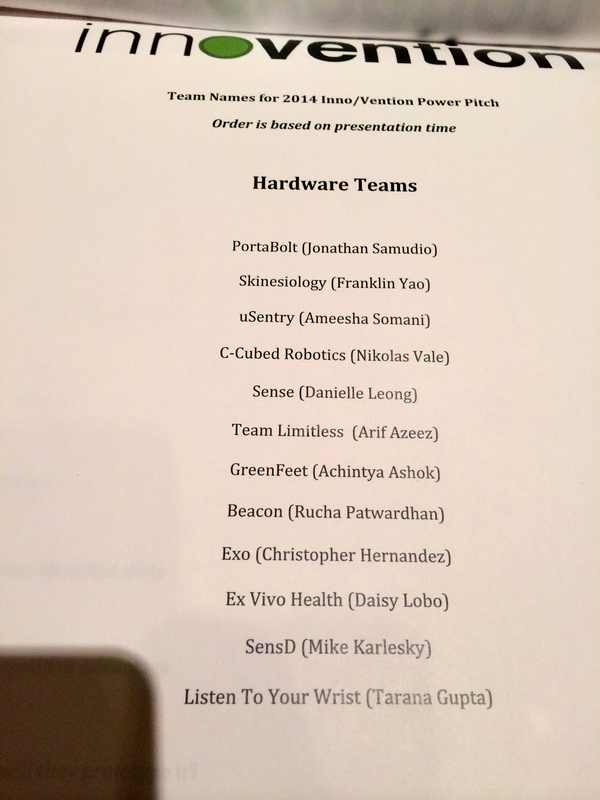 Four entrepreneurs presented. After the announcements, next year predictions and sponsor pitches the audience was treated to some great startup stories. Patrick Raymond presented his Curvit product and the two-year journey from it’s conception to national retail. Curvit solves one of life’s annoyances – it stops “shower cling”, and gives you more space for your daily spritz at the same time. Patrick is the founder of the Inventors Association of Manhattan, and he has hosted of Food Network’s Invention Hunters. It was great to see his progress and he started a Indiegogo campaign. Coming off of their successful Dragon Innovation crowdfunding effort, Hammerhead Piet Morgan, Laurence Wattrus, and Raveen Beemsingh told the story of how they started. I wish I had a picture of the slide they showed of the iterations of their product. They started out in a apartment in New Jersey. LIving together, sharing space and creating a great product. It was great to hear about their problems they faced and the direction they want to take the company. Motorcycle support is next! They are in the R/GA Connect Devices Accelerator. 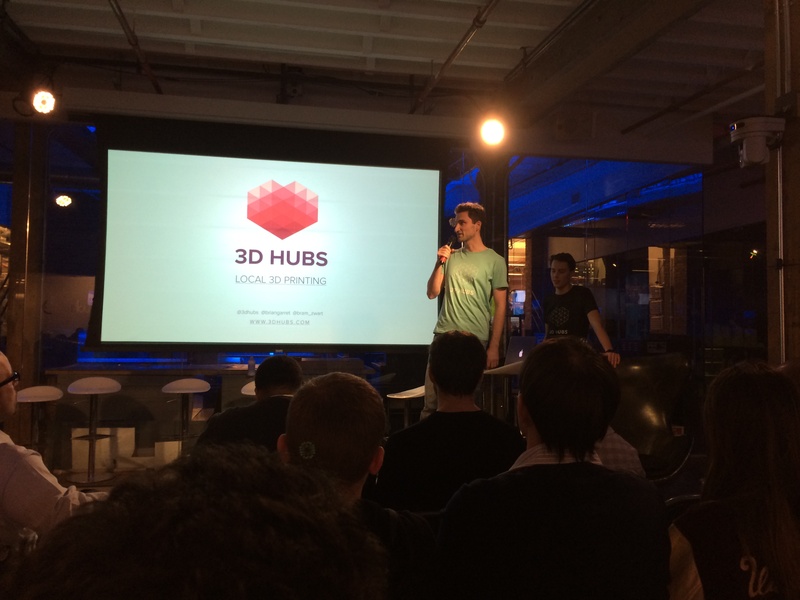 Next up was Kurt Workman‘s and Jacob Colvin‘s story about their Owlet product. The product takes baby monitoring to a whole new level. The Owlet Vital Monitor collects heart rate, oxygen and sleep data, and helps keep parents aware of possible indicators of danger. It was great to hear their story. As parents or would be parents themselves they were their own first customer. Their presentation was great and very warm feeling. Showing baby faces on the screen made people say awe. They fielded questions expertly such as “What about the RF signal? Would cause the baby hard”. Their answer was two fold. They said that doctors say the risks out way the value you get from the information and how Bluetooth LE has at least 10 times less power then cellular RF. Their knowledge showed through. Way to go guys. They are also in the R/GA Connect Devices Accelerator. Next and not least was Ben Melinger. He tells us two stories. The first one was about Smash Cup, a cool green, clean collapsible travel tumbler. I could use this product. I would make coffee at home and then take it with me. Clean it, collapse the cup and through it in my bag. Done. My bag is small so it would fit nicely collapsed. The other product story we heard was bout Fyll, a fashion-forward, tough glass water bottle that keeps water from being flavor enhanced (in a negative way) by plastic or metal flavors. Ben talked about his journey from beginner to pro. He gave the MakeSimply X Education program a shout out. Thx Ben. His story continued by discussing the hurdles he had to over come to get his products to the state they are today. One such hurdle was having to learn SolidWorks. For those that don’t know SolidWorks is a very popular CAD tool that is used to render complex solid 3D drawings and helps you move toward an engineering drawing. The type of drawing that factories want to see. He discussed the huge cost of entry it is to buy this product. He wishes there was a cheaper solution out there that is just as popular. Thanks Ben for your great insights. All in all it was a great event. We have defiantly outgrown that space. I can’t wait for the next meetup. Disclaimer MakeSimply, a company I am co-founder of is co-sponsor of this event.